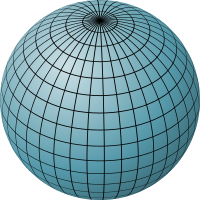 A graticule on a sphere or an ellipsoid. The lines frae pole tae pole is lines o constant longitude, or meridians. The circles parallel tae the equator is lines o constant latitude, or parallels. The graticule determines the latitude an longitude o poseetion on the surface. A geographic coordinate seestem is a coordinate seestem that enables ilka location on the Yird tae be specified bi a set o nummers or letters. The coordinates are aften chosen sae that ane o the nummers represents vertical poseetion, an twa or three o the nummers represent horizontal poseetion. A common choice o coordinates is latitude, longitude an elevation. This page wis last eeditit on 27 September 2018, at 03:50.